Get your fireplace cranking and pop some pumpkin pie in the oven! It's fall, y'all! And I'm so excited to finally introduce our amazing DIY Editor's first official DIY here on Tidewater and Tulle. 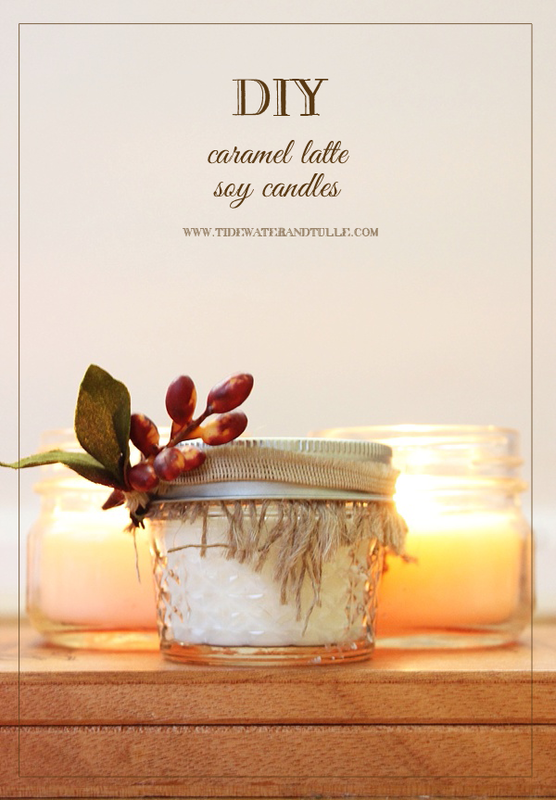 If you haven't met Stacey yet, be sure to pop over to the About page because this gal has a ton of creative ideas in store for us in the future, starting with today's perfectly autumnal do-it-yourself project: Caramel Latte Soy Candles! Mini in size, these little cuties are perfect for both fall bridal shower favors and wedding favors. 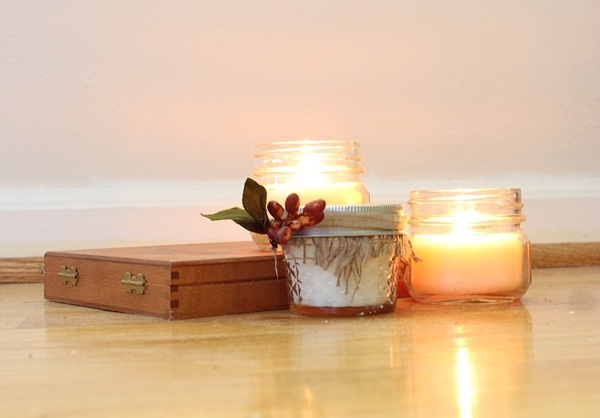 These candles don't go bad, the materials are easy to find locally and online, they are super easy to make, and to boot, they smell mighty delicious for all you hot beverage, candle-lovin' friends out there! I'll let Stacey take it from here! 2. 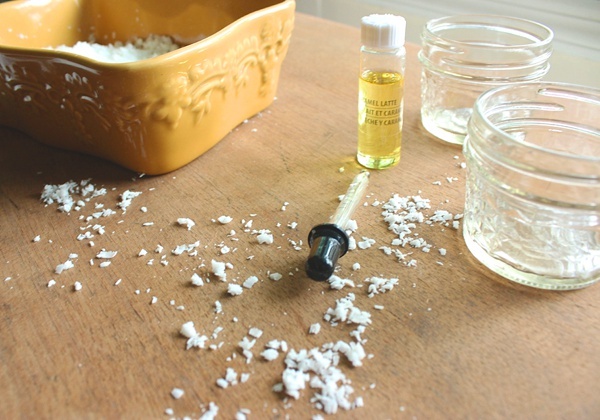 Add soy flakes to large glass bowl. Microwave soy flakes for 1 minute, or until they begin to boil. Frequently stir and continue to microwave until all the soy flakes are reduced to a clear liquid. This process can take 5 minutes. 3. Once the soy flakes are liquified, dip each metal base end of the candle wicks into the wax. Place the ends of the wicks in the center of each candle jar, pressing the metal ends down. The wax acts as a glue, securing the metal end at the bottom of the candle jar. Use the clothespins to help keep the wicks centered and upright. 4. Very gently, pour the wax into each jar. Now add the caramel latte essential oils to the wax; this is done at this step to avoid burning the oils during the melting/cooking process. Add 20 - 30 drops of oil to each jar. If desired, add more or less. 5. Let the candles sit for 6 hours, until fully set. Once set, remove clothespins and trim wicks to desired length. 6. Decorate your jars and enjoy! Did you make these for your wedding or bridal shower? We'd love to see how you personalize them! Share your photo on Instagram by tagging @tidewatertulle and #tidewaterandtulleDIY! All tutorial and photos by Stacey Burrus.